I was lucky enough to see Alter Bridge perform live in Belfast earlier this year, so I had a vague idea of what to expect here. Myles Kennedy, either live or in the studio, has one of the best voices that we’ve heard in rock (or, indeed, most genres of music) of the last few years, maybe decades. But while I know how he sounds live, how would that come across in a recording? The answer? Pretty damn well. There’s always the danger with live recordings that some of the urgency can be lost from the vocals and the guitars, but that’s certainly not the case here. If you close your eyes, it’s as if you’re right there, in the middle of the baying crowd, head banging away and singing your heart out. For my money, the opening songs on any live album are the most important – if you don’t get those right, you’re going to struggle to engage the crowd. And as I’m sure you’ll agree, hearing the crowd roaring in the background can make even a mediocre live album seem that bit better. Luckily, Alter Bridge are no slouches when it comes to their openers – “The Writing On The Wall” and “Come To Life” are possibly one of the greatest opening combos I’ve heard in a very long time. It’s clear to hear that the crowd agree, as they very quickly get into the spirit of the gig. When I’m reviewing most albums, I go through them on a track by track basis, but that doesn’t feel quite appropriate here. This is purely because, for most albums, it’s the songs I’m reviewing. For this album, it’s not so much the songs as the overall performance. And if there’s one thing that you can never fault with Alter Bridge, it’s their performance. It doesn’t matter if you have the best singer in the world (and for my money, Myles Kennedy would be up there in the top one…), or the best guitarist…it’s how everyone comes together that’s important. You need that on-stage chemistry. More importantly, you need it to be obvious. And boy, is it obvious with Alter Bridge. The only thing missing from this album is physically seeing just how well these guys play together. Seeing them actually play makes it abundantly obvious that they just belong on stage together. Yes, they’re brilliant in the studio – but on stage, they truly come to life. And this really comes through in their songs, each of which gains an extra something. It may be an extra edge, and extra bite to the guitar…but there’s definitely something. This is most noticeable on “Watch Over You”. This song is quite an emotional one for me, as it always makes me think of my mother who passed away earlier this year. I can listen to the album version with no difficulty whatsoever, bar bringing a slight smile to my face. When it comes to the live, stripped back version though, that is a completely different matter. When I heard Myles sing the acoustic version in Belfast, I couldn’t look at anyone for fear of letting them see the tears in my eyes. This time, I was glad there was no-one else in the room when I was listening to it. The rest of the live section of this album is nothing short of amazing. Going from such a stripped back, low-key, emotional song as “Watch Over You” to, well, anything, could always prove to be a stumbling block. Luckily, there’s no hangover moving in to “Isolation”, as the energy levels return and intensify. “Blackbird” is another one of those songs that can evoke strong emotions in people, and this version of it truly does justice to a wonderful song. At one second short of nine minutes, it’s the longest track on the album…but it doesn’t feel like it. This is a beautiful, sweeping epic of a song and a true ‘lighters in the air’ moment in a concert that, at times, doesn’t let you draw a breath unless it’s to shout out the lyrics of yet another crowd-pleasing song. “Show Me A Leader” opens with a guitar solo that doesn’t feel out of place, but right at home kicking off this version that has the crowd singing along with everything they’ve got…and after this incredible concert, it’s surprising they have anything left. In fact, by the end of the live section of this album (the ‘Rarities’ are still to come! ), I was almost as exhausted as the crowd must have been. Yet, at the same time, I felt incredibly pumped, as if I had been at the gig itself and was getting by on the pure adrenaline of having been privy to one of the great rock bands of our time. So, without any ado, I crashed on into the rarities. “Breathe”, the first of these, mixes emotional vocals with the sort of guitar play that we’ve come to expect from Alter Bridge. It’s actually surprising that this could be deemed a rarity – it feels like the sort of song you’ve heard before, and not in a “they all sound the same” way. It has a pleasing familiarity to it that could easily see it played at future gigs. “Cruel Sun” wouldn’t sound out of place on any previous Alter Bridge album – and already this section is making you realise just how good a group they are, if they can afford to leave these songs on the bench, as it were. One of the real strengths of the rarities section of the album is the fact that the songs aren’t all simply the same. There’s a depth and variety to them that you’d expect from Alter Bridge, yet they aren’t simply rehashes of previous glories. Some of these, if not all, could be easily taken from any Alter Bridge album, and indeed could have been released as a separate, stand-alone one. 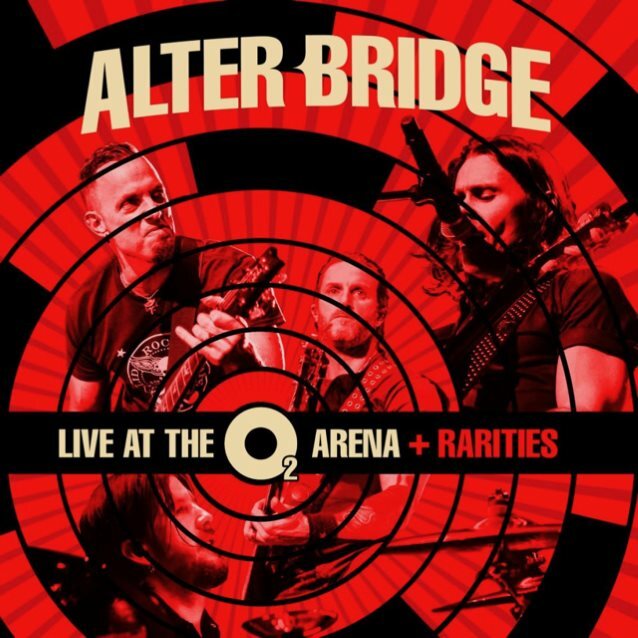 And for me, that shows just how confident Alter Bridge are – that they decided to release this together with a live album might not make the most commercial sense (why sell one album when you can sell two? ), but in a way, it’s thanking the fans. If you’re an Alter Bridge fan in any way, shape or form, then buy this album. If you’re not sure about them, buy this album. The rarities alone are worth the cover price – the live section is the cherry on the icing on the cake. While this album did bring back fairly emotional memories, it also made me realise just how lucky I am to have seen these guys live. Even better, I have tickets to see them when they come back to Belfast in October. Quite frankly, I can’t wait. Now to wait till this album gets released to buy a physical copy…well, I have to have something for Myles, Mike and the lads to sign if I ever meet them. And it’ll make it easier to pass on great music to my children, if I have them, when they’re old enough to appreciate it.